Such a wonderful book. Mitchell is a genius. Thanks for sharing! 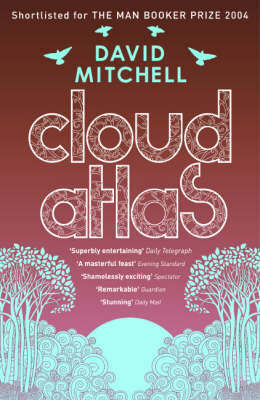 It is a brilliant book, and Mitchell certainly is a genius. So glad I persevered with it! Will head on over and check out your blog, too. Isn’t he infuriating but brilliant, Heather? I found myself thinking about Cloud Atlas for weeks afterwards, and rabbiting on to anyone who would listen. He certainly is Aislinn! I loved it so much that when I found out there was a movie so I borrowed it from the library – it’s good – though not as good as the book (of course – I think it would have to be made in to a tv series to even have the chance of giving the book any justice), though the DVD stopped working in the last 15 minutes, so I don’t know how the movie version ended. But like you, i am still thinking about it, how clever it was, and how he managed to write so many different styles into the one book, and that idea of being reincarnated into different lives… I could go on and on!